Cast: Ed Speleers, Jeremy Irons, Robert Carlyle, John Malkovich, Sienna Guillory, Garrett Hedlund, Alun Armstrong, Rachel Weisz, Djimon Hounsou, Joss Stone. 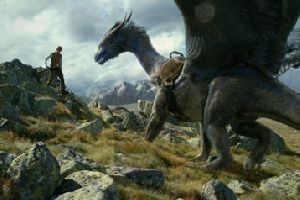 Eragon is an all-action, crowd-pleasing, big budget fantasy dragon movie. So why was I bored shitless? Maybe it's because it's trying to be a mini-Lord of the Rings, but it's much cheesier. Where the Rings trilogy stretched straight-facedness well past breaking point, Eragon plumps for traditional, and therefore very predictable, shallowness. All the important detail is removed, leaving us to swallow anything we're told - the framework is there, but it's not fleshed out. For example, we learn that "dragon riders" can perform magic and that it drains them - which is a nice touch - but that idea isn't pursued or developed. The dragon is born and then bingo, she's all grown up and buggers off whenever it's not convenient to have a 30-foot reptile hanging around. No-one seems concerned about where she goes. I would be, wouldn't you? The lead role is taken by newcomer Ed Speleers and, to be fair, he's not up to the job. He has no screen presence whatsoever and he's so bland that a stick of celery would look interesting in comparison. Fortunately Jeremy Irons is on hand as his very conveniently available mentor (with a painfully obvious "secret" history) and he does add some much needed weight, but it's Robert Carlyle who wins the performance trophy as the nasty "shade", under the command of similarly watchable John Malkovich. Malkovich is vastly underused, which suggests the sequel may already be in production, but if it is, I hope they're using a different director, because Stefen Fangmeier makes a right fist of this episode. Fangmeier is a special effects guy - among his past triumphs is the visually magnificent Master and Commander as well as older trailblazers such as The Perfect Storm, Twister, Jurassic Park and Terminator 2. This is his first time in the director's chair, so I suppose I should be lenient - let's hope he gets better. Considering his past, I expected a little more from the effects. Sure, the night-time scenes are superb, but in the daylight the dragon looks wooden and no better than, for example, Dragonheart, and I can't help thinking that as a nipper the dragon looks a bit ... well ... muppety. The miscasting of the voice doesn't help much either - Rachel Weisz adds strength to her voice in an attempt to fill the role, but she's still vastly incongruous with the big scaly monster. Young singer Joss Stone jumps on the acting bandwagon briefly, appearing as a fortune teller midway through the movie - just as well she has the singing to fall back on, ahem. Still, at least we have Sienna Guillory (looking spookily like The Rings' Liv Tyler) to perv over. Eragon fulfils only a small part of its considerable potential due to some clumsy storytelling, inadvisable plot simplification and a complete absence of character. It's actually not that bad, and I think that lots of viewers, particularly younger ones, will be less picky than me and will enjoy it - it just could and should have been so much better. To enjoy this film you should be: a fantasy fanatic. Eragon was released in the UK on 15th December. I was so looking forward to this film, having read the book and become a fan, however the film leaves so much of the book out that the story just falls apart, however if your interested in the film I'll try to portray a bit of the story to you by copying a book review by Hilary Williamson from http://www.reviewsofbooks.com/eragon/ so at least you'll have a fighting chance if you goto see it. I would suggest, however, that you read the book in this case. "When young farmer hunter Eragon (who, of course, grew up innocent of his heritage and destiny) finds a flawless, polished blue stone, he's at first unaware that it's a dragon's egg. It was in the charge of an Elven lady, who sent it towards safety, just before she was captured by a Shade. There's an irascible old wizard, Brom, masquerading as the village storyteller, and an evil, all-powerful Emperor - once a Dragonrider, who long since turned to this world's Dark Side. Naturally, he's after the egg, and also anxious to suborn the one who can get it to hatch. There are increasing incursions by brutish (orc-like) Urgals, and a Rebel alliance fighting the Emperor, including humans, dwarves, elves, and perhaps a traitor or two. The dragon egg chooses Eragon as its Rider, hatches, and they communicate telepathically. After Ra'zac (cowled dark riders) destroy Eragon's uncle's farm, he travels with Brom and his dragon Saphira in search of vengeance. Along the way, Brom trains him gradually in swordplay and in magic (are you surprised that he displays a talent for both?) and Saphira teaches him to be her Rider. All in all, it's a bit like Star Wars meets Lord of the Rings, with shadings of Anne McCaffrey's Dragonriders of Pern. But that's ok, as the author builds his own world and story out of these familiar elements. 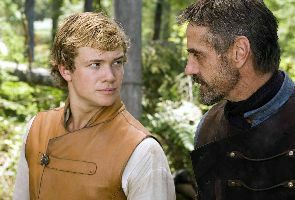 I especially like the nagging, caring relationship that develops between boy and dragon, and I appreciate the young hero's values, and his concern about killing even the bad guys. As the trio travel together, Eragon dreams of an Elven lady in need of rescue. He gains a prickly friend in Murtagh, who has a few secrets of his own. And eventually, in a race against time to save the lady, he reaches a marvellous rebel city-mountain, where he must carefully navigate tangled politics of man, dwarf and elf, while also dealing with the malevolence of the Twins. There's an exciting battle in a crescendo of a conclusion. What next? We wonder along with Eragon who his father might be. Could it possibly be the evil Emperor? It will be great fun to find out." eragon: a story of frienship, dragons, love, good v. evil, learning respect, believing in yourslef, swords, trusting others, and my favorit: Being the best book since LORD OF THE RINGS!!!!!!!!! ERagon is one of the best, second to LOTR. People, you need to see this movie and name it a family movie, all right, young kids and people who can't stand vilonce stay away, but young advernturers, get ready to dive into one of the best movies of the mellinea! did i spell that right?